Look knock-out this season in this stylish tie-up jumper dress. Featuring two side high splits and an eyelet design, this cute knit is so on-trend right now. 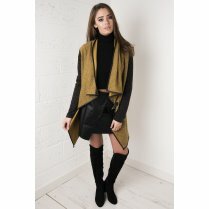 Team with a pair of super tight skinnies and chunky ankle boots for a A/W look to be envied.